Lyle: Besides teaching you how to play music on your guitar, I will help you on the following topics: how to choose and buy a guitar, how to choose an amp - effects, strings - what kind to get, when and how to restring, picks, basic tools you need, how to tune your guitar, anatomy of the guitar - electric and acoustic, how to hold the guitar, how to hold the pick, using a strap, how much should you practice?, how I learned to play guitar, how long will it take until you get good?, where do you put your fingers?, how to read TAB, chords, strumming, finger picking, scales, playing melodies, finger exercises, music theory, ear training, basic song structures, chord progression formulas, all the different guitar effects noises and techniques, and a guide to reading all the different TAB symbols. Lyle: There are so many things to cover so let's get started! Lyle: A good electric tuner can cost anywhere from $20 - $50. Ask your sales person to show you how to use it before you leave the store with it. Lyle: To help you remember the name of each string, just remember this silly phrase: Easter Bunnies Get Drunk After Easter. That is from string 1 through 6. Lyle: Here's an interactive TAB file. 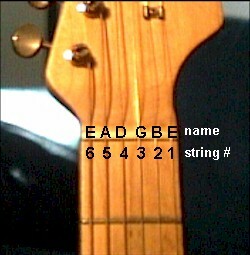 It has the correct tunings notes of each string. Click on the TAB file, it will load over to the right side of the page to the interactive TAB player. Then click on Load Media, or Media, you will now see and hear the TAB file playback. You'll hear the sound of my guitar. Match up your strings to the sounds of mine by turning your tuning pegs. Notice you're starting with the low/big E string. Lyle: Remember, tuning is difficult for most beginners. That's why I suggest getting and using an electronic tuner so you don't waste your time and patients trying to tune. Lyle: Always tune in the SHARP direction. Sharp is high, Flat is low. Suppose you are trying to tune the fifth string to A. Currently the string is flat. In order to tune properly you need to turn the tuning gear until you hit A. If you go SHARP, the WRONG thing to do is to turn the gear down until you hit A. The reason this is incorrect is because there is still a minute amount of slack in the tuner--no matter how good the tuner is, there is ALWAYS some slack. Lyle: If you go too far sharp, the PROPER way to tune is to turn the gear so that the resulting note is DELIBERATELY flat. In other words, going back to our example, if you overshoot your A note, then turn the tuner so you are FLATTER than A. Now give the string a tug, as you would do when you are stretching, the slack in the tuner will give. Now tune towards the A, being careful not to overshoot. If you overshoot, repeat the process. The key is to tune in the SHARP direction only! Lyle: There are 3 basic types of strings for the 3 types of guitars: Nylon for classical acoustic guitars, Bronze wound/steel for steel string acoustic guitars, and Nickel wound/steel for electric guitars. Lyle: There are many different companies that make guitar strings such as Ernie Ball, Dean Markley, GHS, and D'Addario. I like them all. Strings come in sets ranging in different tensions from extra light to heavy gauge. The thicker or heavier the gauge of string, the harder it is to push down but the bigger the tone is. I suggest to you, as a beginner, is to start with light gauge strings so your fingers wont get too sore. For my acoustic guitars I use a medium-light gauge string size and on my electric guitars I use a light gauge. Lyle: Strings get old and dirty from the acidic sweat and oils from your hand. The strings will start to loose their original shiny appearance and become dull and muffled sounding. They also can become brittle and break on you and hard to keep in tune. To keep your strings clean and long lasting you should wash your hands before you play, then wipe down the strings and fretboard with a soft cloth after you're done playing. How much you play and how clean you keep the strings depends on how often you should change your strings. I'd say once or twice a year for acoustic guitars, more often for electric guitars because they have smaller strings and become dead faster. I change strings on my main electric guitar once a week because I play it so much. New strings and a clean fretboard feels good on my hand and also the tone is best on new strings. 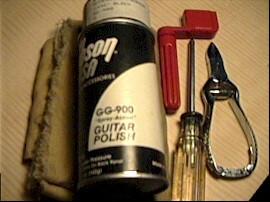 Lyle: A soft cleaning cloth, guitar polish (available from your local music store), peg winder, wire cutter, and a small Phillips head screwdriver. Lyle: That's all for this lesson on tuning and your strings. Next you'll learn how to play stuff!